I am excited about this review because my family and I got to try out some new products that are pretty awesome. I love tea but have never had a kettle before. I love this one from Capresso called the H20 PRO. It heats the water for tea quickly and is great for serving several people at once. When I have people over, I will heat up a big pot of water in this and serve everyone tea! My parents got to try out the MT 600 Plus coffee maker. We go up north with them to their farm all the time and their coffee maker needed an upgrade. The old was taking pretty good coffee and making them taste not the best. We chose this coffee maker because the stainless steel pot will help to keep the coffee hot for much longer than a glass pot. So far, it works great! This is what my dad had to say " Worked well. Fast. Good coffee. Kept coffee hot. Sleek look.". 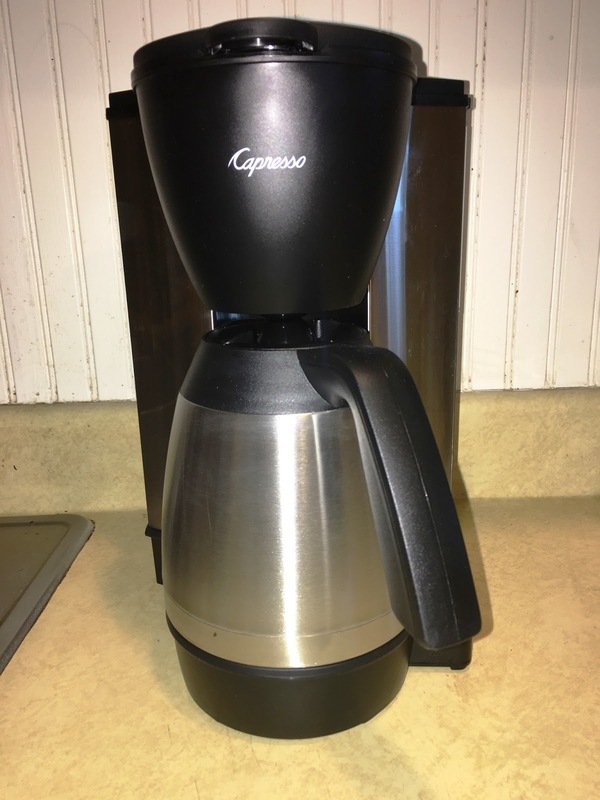 I also got the Capresso triple brew to review. It is really neat because you can make single serve coffee, carafe coffee and single serve tea with it. It does not use pods or capsules like other brands so it is better for the environment. I recently got to try out a new-to-me monthly subscription service called Yogi Surprise. As the name gives away, this service provides yoga type products right to your door. In a box, you will get 6-8 full-sized yoga lifestyle items. A monthly box is $45 per month. My favorite item was the Suja juice. I picked up one of their green juices at my local Kroger with my coupon and loved it. So did my 20 month old daughter! I love Stoneridge Orchards dried cherries as well and my husband enjoyed the pumpkin seeds. My little girl is obsessed with the Herban Essentials essential oil towelettes in orange scent. She loves wiping her hands with these (and carrying the rest of the unopened packages all around the house with her haha). I have not tried the Rishi tangerine ginger tea yet but I'm sure that I will love that too! I have said it before and I will say it again, I am not a baker. I love to make "homemade" pizza and stuff like that but I never make the dough myself. I usually buy pre-baked doughs but found a new option that is delicious. Wewalka makes different kinds of dough including pizza dough that is easy to work with and makes a delicious pizza. I like the thin and crispy crust the best. You just roll out the dough on their parchment paper which makes cleanup easy! You do not even have to grease, butter or spray the pan either. I made the best dessert with the puff pastry dough. Just fill with frozen fruit, top with cinnamon and bake. Simple and quite healthy dessert! I have purchased the Wewalka Dough and I also love the thin and crispy. It was so easy to use and it has a relatively good shelf life in the fridge. How in the world are you getting products for free? Hi JoAnn, please email me at achernandez711@yahoo.com if you want to discuss how to pitch companies!